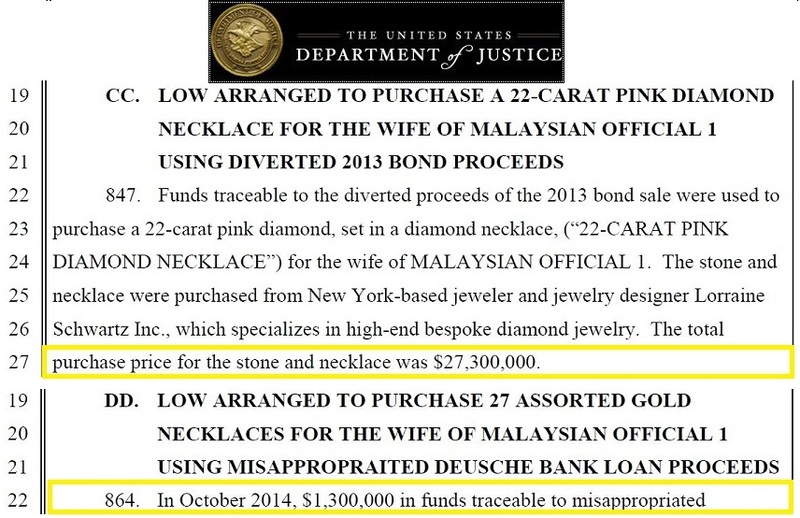 US DoJ REVEALS NAJIB & JHO LOW STOLE RM19 BILLION, ROSMAH RM130 MILLION IN DIAMONDS & GOLD JEWELLERY! 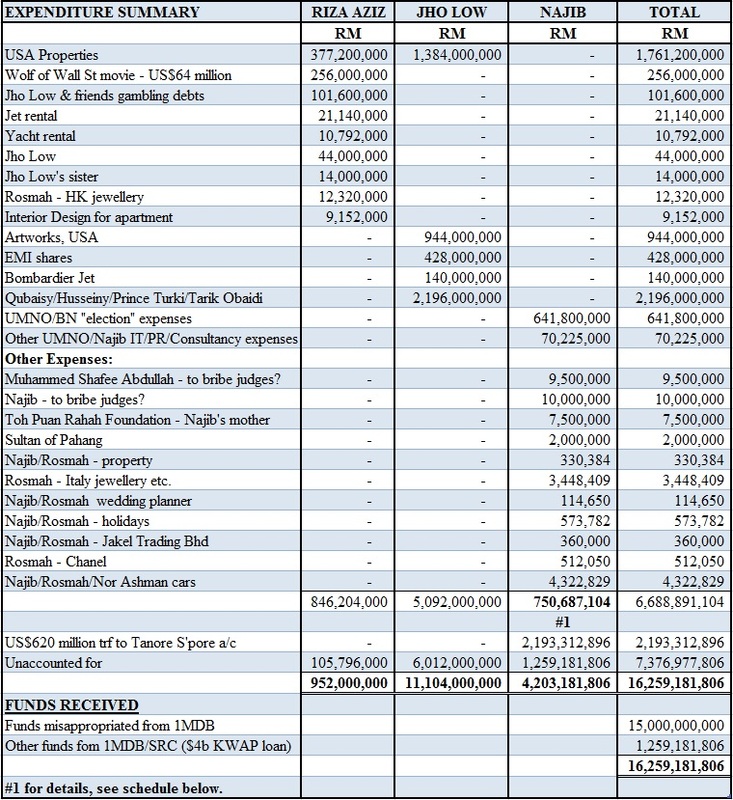 On 15 June 2017, in a 251-page charge sheet, the Money Laundering and Assets Recovery Section (MLARS) of the US Department of Justice served notice to interested parties, that it had filed civil cases to recover some RM5 billion of assets bought with 1MDB funds stolen by Najib, Rosmah, Riza Aziz (Rosmah's son and Najib's step-son), Jho Low and their cronies/nominees. CLICK HERE. This includes some additional 17 asset-items to the 20 already listed in their earlier 136-page charge sheet filed on 20 July 2016. CLICK HERE. The Us DoJ has yet to file cases to recover the entire RM19 billion. This is presumably because much of it was spent outside the US where it has no jurisdiction to prosecute or seize assets. One can also assume that they are still in the process of identifying the location of many assets. This is of course the heist of the century. More than that, at least another RM11 billion is missing from the books and bank accounts of 1MDB and another RM 4 billion from SRC. What is breath-taking is the complete denial by Najib and Rosmah of the staggering scale of theft, looting and spending spree they have been indulging in. 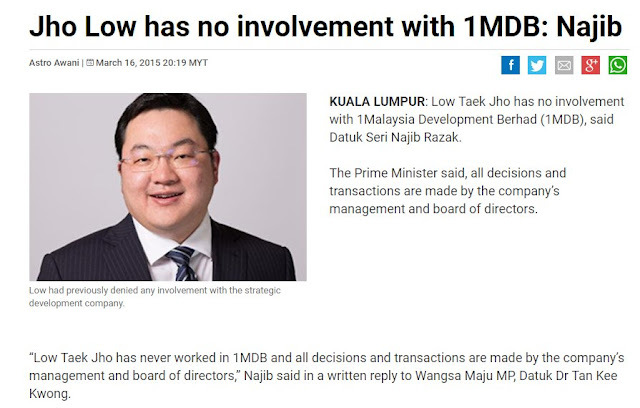 Najib, as is the trademark of a mad serial liar, had denied in Parliament that Jho Low had any position in 1MDB!! And yet, he is now a fugitive apparently hiding in Taiwan, operating from his RM1 billion super-yacht, Equanimity, bought with our stolen money! When Najib and Rosmah's complicity was exposed by the Wall Street Journal (WSJ) in 2015, he threatened to sue. Even schoolchildren know that this well never happen. Najib, Rosmah, Riza and Jho Low are the very epitome of greed, vanity and immorality. Their scale of corruption has gone off the charts. It's incredible that for an ageing, short, fat and balding woman who looks like the back end of a worn-out bus (not that its front-end would be any prettier), our so-called FLOM should entertain the slightest notion that RM130 million of diamonds and gold jewellery would somehow make her look more attractive and endearing to a seething public. Now, she can only run her fingers through them in private, as she dares not be seen in public wearing her ill-begotten gains. The US DoJ has not listed this RM130 million bought for her by Jho Low as among the items they wish to seize. 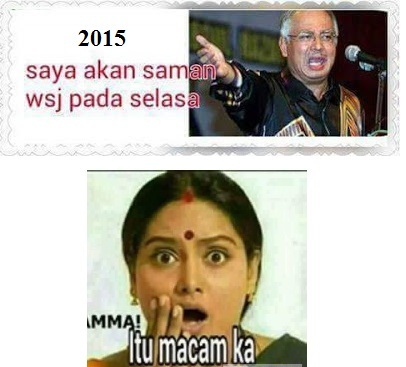 Rosmah is identified by them as 'Wife of MO1' i.e wife of Najib! 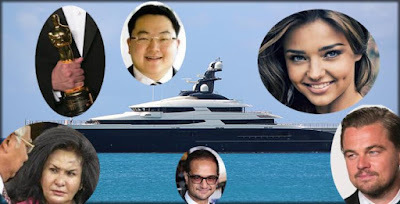 However, they are seeking seizure of RM44 million of pink diamonds and jewellery Jho Low lavished on Australian model Miranda Kerr, in a wooing spree that might make even a Rockefeller look like a cheapskate. Alas, she ditched him and married Snapchat billionaire Evan Speigel in May 2017. Having oodles of (stolen) money is one thing; looking like a shorter version of (a crooked) Billy Bunter is another. Perhaps, Miranda Kerr is a lot smarter than your average Victoria's Secret model on the lookout for a billionaire sugar daddy or meal-ticket for life. Who'd want to hitch-up with an ugly version of a Teletubby, who could soon be pacing a cell-space in San Quentin State Prison, California, US of A? It is therefore the duty of the King and the Council of Rulers to do what is right, and send them all to where they really belong - Bamboo River Resort or Tanjung Rambutan, for the rest of their natural lives. There is of course the democratic route to disposing of Najib; but with the money he has plundered from 1MDB and SRC, he is capable of buying himself another term as PM. We MUST NOT allow that; we cannot take that chance. The religious extremism and racism we see galloping away in Malaysia is the result of Najib willing to turn us into an Iran or Taliban/ISIS State, if that is what it will take to keep himself in power. We are at a cross-roads. If we do not throw Najib and his government of thieves, plunderers, looters and murderers out by taking the bull by its horns, then get ready your boat! For reason's best known to PM Najib, he appointed Roti Jala, of Transformers fame, the serious task of unraveling the mess in Felda Global Ventures Holdings Plc (FGVH). Roti Jala, who normally does not take anything seriously, but waffles and bluffs his way through complicated economic theories, was only too glad to help Najib, considering he had no real job. Roti Jala had convinced Najib to ditch Mahathir's Wawasan 2020, (Vision 2020) announced in 1991, to be replaced by GTP, ETP, NTP, PEMANDU, KRA, NKRA, KPI, Transformers, Autobots, Decepticons, Maximus Prime and Megatron. If Roti Jala had hoped to confuse everyone by blinding them with acronyms, he succeeded exceedingly well. In his previous job as MAS CEO, he had succeeded in convincing Najib and UMNO that MAS was only a teeny-weeny step away from overtaking SIA. He did this by selling off MAS HQ for about RM1.8 billion and claiming MAS had "turned the corner". Predictably, MAS collapsed shortly after Roti Jala departed to PEMANDU, driven by an ambition that said, if you want to fail, FAIL BIG! 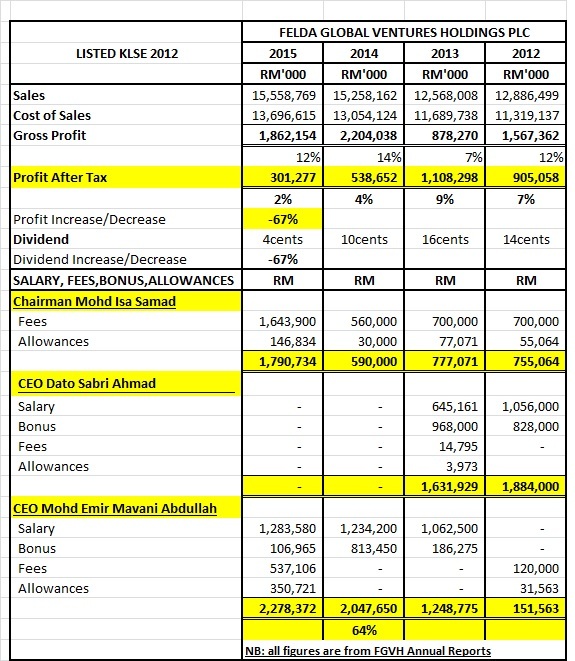 PEMANDU was put in cold storage after it was found that they had not achieved national income growth targets and had been massaging statistics with unrealistic projections and moving base years to give 'feel-good' numbers. So, Roti Jala and Najib came up with TN50 - Tipu Negara 50Tahun with a budget based on Najib's acute and nimble mathematical skills and budgeting expertise, viz, the gaffe of 26-9=15! As in UMNO/BN, and particularly under Najib, big failure is always rewarded with bigger promotion. 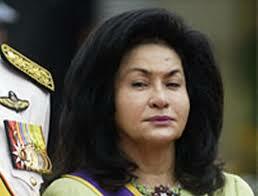 Roti Jala, driven to success and intoxicated with power, became owner of privatised PEMANDU and Chairman of Heineken! CLICK HERE. Roti Jala, appointed in his "personal capacity" (whatever the eff that means), had hoped that his in-depth and scintillating Top, Top Secret FGVH report to Najib would be kept under lock and key, so that his brilliant transformational change recommendations could be swiftly implemented. But, unfortunately for him, and fortunately for the Rakyat, the report was leaked to Donplaypuks®. I refer to my recent appointment in my"personal capacity" (whatever the eff that means) to look into the affairs of FGVH. 1. There is no rumour to the truth that there were incidents of corporate misgovernance, malfeasance, misfeasance, corruption, misappropriation of funds, false accounting, crony award of multi-billion ringgit inflated contracts, fraud or money-laundering. 2. Any rumour to the truth is the result of a George Soros, Jewish, Zionist and Singapore conspiracy and plot. 3. 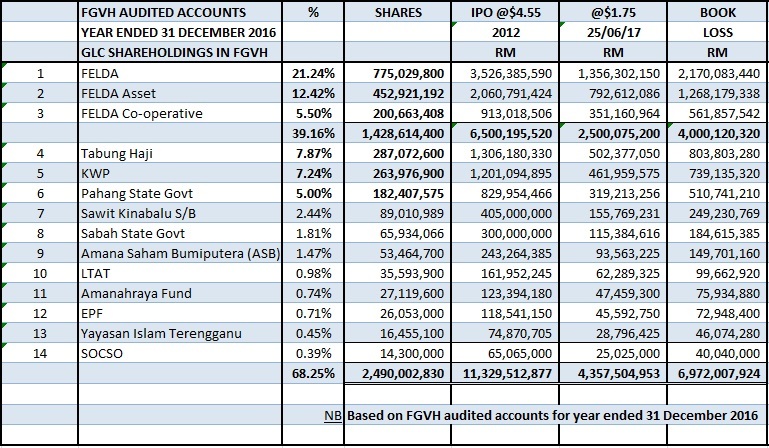 It is true that FGVH shares prices have dropped by a disastrous average of 65%, from the 2012 IPO price of RM4.55 to RM1.60. 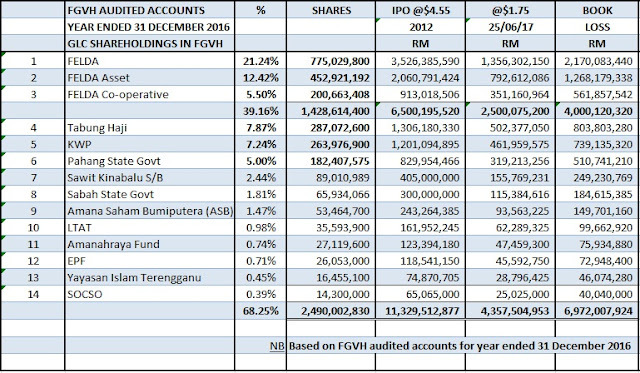 As a result, FELDA and other GLC's have suffered about RM8 billion book loss on FGVH shares. 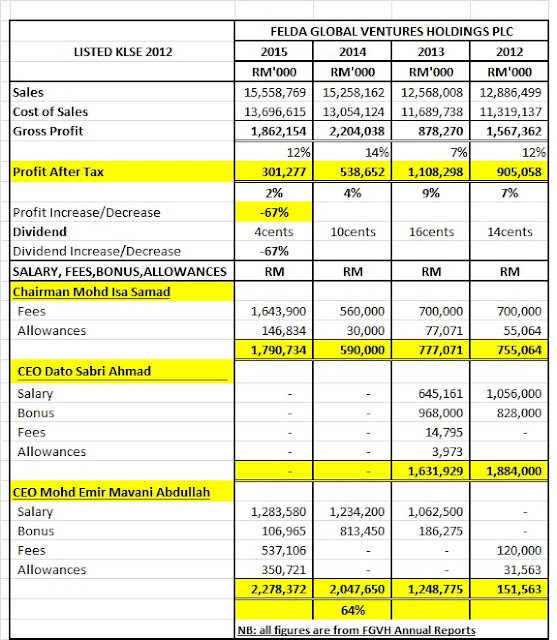 In no way is this His Royal Highness and My Personal God Najib Tun Razak's fault even though you had inflated the IPO price with unsustainable projections and forced the GLC's to buy the shares after threatening their Chairmen, CEO's and directors with sackings. Not to mention failing to provide for replanting costs in the IPO projections. 4. 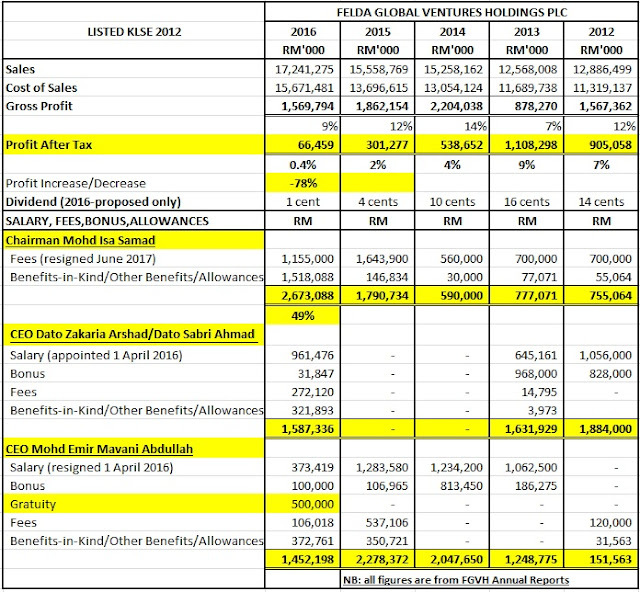 While it is true that FGVH profit after tax dropped by 67% between 2012-2015, and that Chairman Jesus Asmad's remuneration had increased by over 200% during the same period, he is not to be blamed. He should not be sacked or asked to pay back his gaji buta bonus. We should blame Anwar Ibrahim, Lim Kit Siang and/or Dr.Mahathir. 5. While it is true the recently departed Marvellous Marvani Da Man was the CEO, he too should not be blamed for FGVH's disastrous drop in profits. 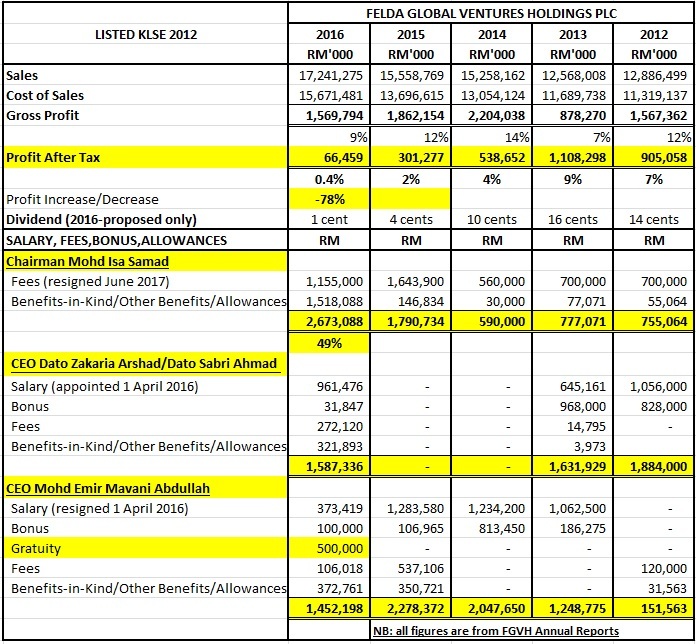 After all, what would happen to all our GLC's if CEO's were forced to be accountable for profit performance? Surely, it is due to the lack of support from the Chinese (apa lagi Cina mahu? ), Indians (all gangsters and hit-men) and the lazy non-Muslim heathens and buggers in The Land Below The Wind and the Land of the Hornbills. 2. For a small remuneration package of RM12 million a year plus share options of RM500 million, I am once again, in the interest of Tanah Air Ku, willing and prepared to make great sacrifices and be appointed sole MD of FGVH and FELDA. 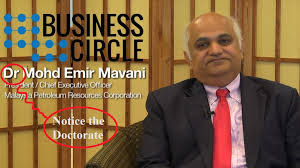 (Shahrir Asmad who has already received RM1 million you stole from 1MDB/SRC so generously gave from your own pockets, knows as much about the oil palm industry as he does about quantum physics). The office of Chairman will be abolished. Charimakan Jesus Asmad will have to be prematurely terminated and punished severely with a severance package of RM100 million. After all, he has sacrificed so much to ensure FGVH did not totally collapse, by shifting the blame to others. I hope to hear from you soon confirming my new job. RM16 BILLION LOOTING OF 1MDB BY NAJIB & UMNO/BN WHISTLEBLOWN! In March 2017, I had revealed details of RM15 billion looted from 1MDB by Najib, Rosmah and her son Riza Aziz, crony Jho Low and the Arab gang of Qubaisy, Husseiny, Prince Turki and Tarik Obaidi, assisted by other minor players. CLICK HERE. However, details of what exactly Najib and his family had blown their share of the loot on, were not too clear then. It is only in recent months that more specific details have emerged from documents leaked by a whistleblower from MACC, to Sarawak Report and PKR MP Rafizi Ramli. The total amount embezzled from 1MDB that we know of is about RM16 billion. See table below. The amount stolen by Najib alone is about RM4.2 billion. This is based on information published earlier by the Wall Street Journal (WSJ) that between 2011-2015, some US$1,050,795,451.58 @ average exchange rate 4 = RM4.2 billion, had flowed through Najib's personal bank account with AMMB!! CLICK HERE. 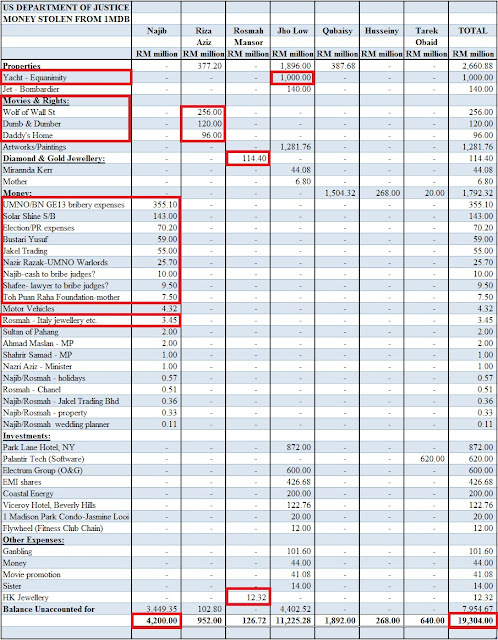 Many have asked why it was necessary for Najib to have the infamous RM2.6 billion (US$681 million) transferred to his bank account, and then, approximately RM2 billion (US$620 million) transferred out again in 2013. This was necessary to "cleanse" the money that was stolen from 1MDB. Earlier, Jho Low had trouble with Deutsche Bank's due diligence department, in transferring money raised in the USA by Goldman Sachs, to non-Government of Malaysia bank accounts. He somehow managed to bluff his way out. He could not risk it a second time. So, Najib misused his position as Finance Minister, to transfer the RM2.6 billion to his bank account and out again, as once it had been established that the source of the money was from Malaysia's Prime Minister and Finance Minister, no one abroad would question its legitimacy. Of course, Yeti at Bank Negara closed an eye to that massive crime by Najib and Jho Low. 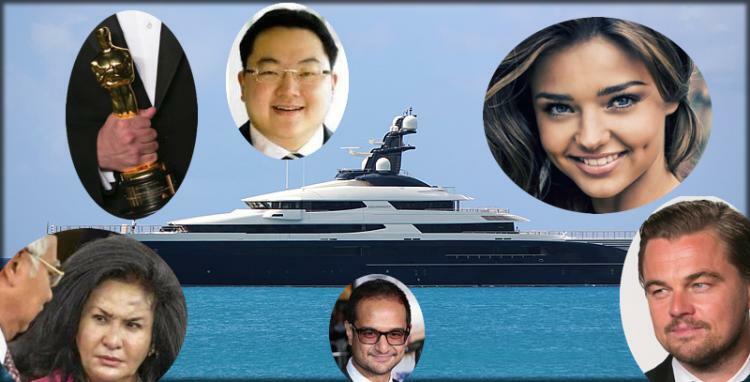 It was wholly an exercise in international money-laundering by Najib and Jho Low! It is now very, very clear that Najib broke every law in Malaysia, and several others in many other countries too, to buy his way to victory at the 2013 general election. The main beneficiaries of the RM4.2 billion were of course UMNO and component parties of BN. More than that, there is every probability that Najib deployed stolen money to bribe judges and enrich himself and his family. Many UMNO/BN MP's are hiding behind the fact that the money they received and pocketed did not come directly from Najib's bank account, but (was illegally laundered) through Party and third-party bank accounts e.g. Nazir Razak, Najib's younger brother. How on earth could Najib bring himself to use stolen and horribly tainted money to "donate" RM7.5 million to his mother's Toh Puan Rahah foundation? What was the money used for by the foundation? It only goes to show that Najib has lost all sense of right and wrong in the pursuit of power. 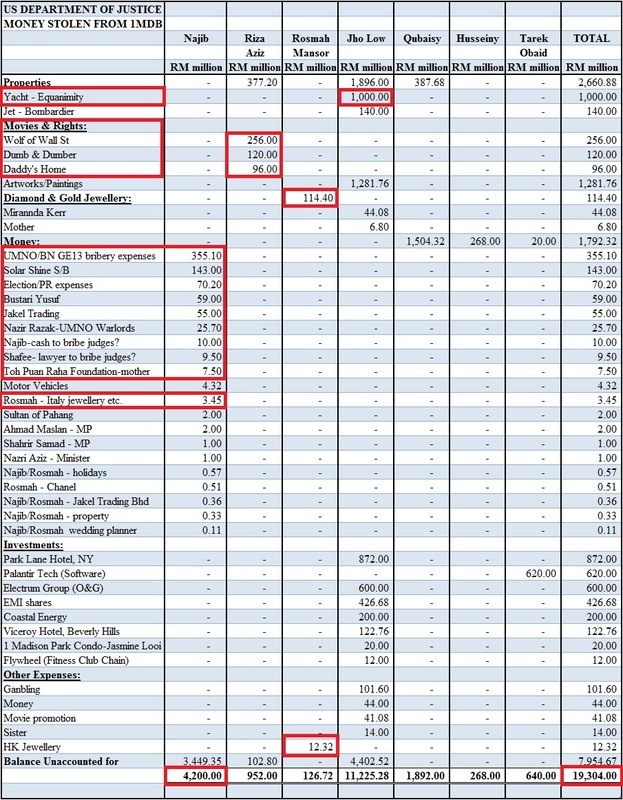 Riza Aziz's bank account was also used by Jho Low to launder many of his expenses. The good news is that more and more information is emerging with each passing day. The bad news is we still do not know exactly how much of MoF's debt of RM 46 billion, comprising RM42 billion of bond debt and other 1MDB borrowings and RM4 billion of KWAP loan parked under SRC, is lost forever. The truth is being expertly covered-up by Najib and his civil service henchmen. More bad news is that Najib has to come up with another RM15 billion (US$3.5 billion) by Dccember 2017 to settle 1MDB's additional debt owed to Abu Dhabi's IPIC, arising from the arbitration case it lost in London in April. But have no doubt, this is the heist of the century by Najib and no one from UMNO/BN dares ask him to step down as they have, together with our top cop and the judiciary, all been hopelessly compromised (bribed). More than that, as Asia Sentinel remarked, 3 murders - Altantuya, Hussain Najadi and Kevin Morais - revolve around Najib and Rosmah. And have no doubt, they will ALL pay for it with long stints at Bamboo River Resort!